"Take your pants off and put them on your head." 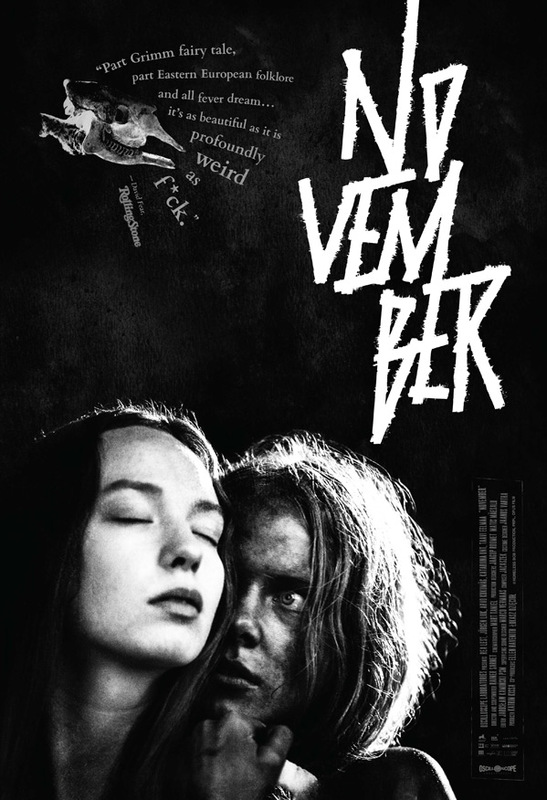 Oscilloscope Labs has debuted the official US trailer for an insane fantasy horror romance film from Estonia titled November, which first premiered at the Tribeca Film Festival last year. Adapted from the best-selling novel Rehepapp by Andrus Kivirähk, the film is set in a 19th century village, where the peasant girl Liina longs for the simple boy Hans, but Hans is inexplicably infatuated by a visiting German baroness who possesses all that he longs for. Rea Lest stars as Liina, and Jörgen Liik as Hans, with a full cast including Arvo Kukumägi, Katariina Unt, Taavi Eelmaa, Heino Kalm, Meelis Rämmeld, and Dieter Laser. This film won Best Cinematography at Tribeca last year, and stopped by a bunch of other festivals. It certainly looks great, also seems weird and twisted and dark as hell. In this tale of love and survival in 19th century Estonia, peasant girl Liina longs for village boy Hans, but Hans is inexplicably infatuated by the visiting German baroness that possesses all that he longs for. For Liina, winning Hans' requited love proves incredibly complicated in this dark, harsh landscape where spirits, werewolves, plagues, and the devil himself converge, where thievery is rampant, and where souls are highly regarded, but come quite cheap. With alluring black and white cinematography, Rainer Sarnet vividly captures these motley lives as they toil to exist — is existence worth anything if it lacks a soul? November is directed by Estonian filmmaker Rainer Sarnet, of the films Where Souls Go and The Idiot previously. The screenplay is also written by Rainer Sarnet, adapted from the best-selling novel Rehepapp by Andrus Kivirähk. This premiered at the Tribeca Film Festival last year, and also played at other festivals. Oscilloscope Labs releases November in select theaters starting February 23rd later this month. Anyone?